Phylogenetic relationships among members of the genus Batrachoseps after Jockusch and Wake (2002). The genus Batrachoseps includes 19 species of terrestrial lungless salamanders that are endemic to the Pacific Coast of North America. 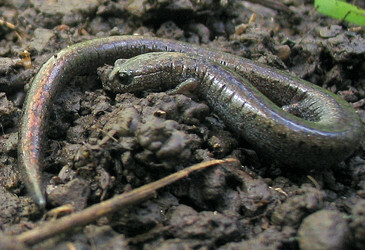 Because most of these species are highly elongate, these salamanders have earned the common names “slender salamanders” and “worm salamanders.” They are distributed throughout moist regions of California, where 16 species are endemic, with two species occurring in Oregon (1 endemic), and one extending into Baja California. Species of Batrachoseps are subfossorial or fossorial and can be found by turning logs and rocks on moist substrates. In parts of California, they are common in gardens and parks, and population densities are high in some coastal regions. Many species are morphologically cryptic, and were first identified with molecular studies. Distinguishing species on the basis of morphology alone is very difficult. Yanev (1978) found that clusters of populations identified by morphometric traits were more concordant with clusters generated from environmental differences than with clusters generated by allozyme variation. Species ranges are largely parapatric, but limited sympatry occurs. No more than two species have been found to occur sympatrically, and many sympatric pairs can be distinguished by small differences in body proportions (particularly in the overall degree of elongation, and in the size of limbs). Sympatric species belong to different major clades except for B. nigriventris and B. stebbinsi. The main synapomorphies for the genus Batrachoseps are the presence of only four toes on the hind foot (a trait that is found in three other plethodontid species, Hemidactylium scutatum and the close relatives Eurycea quadridigitata and Eurycea chamberlaini) and a freely projectile tongue attached anteriorly by an elongate genioglossus muscle (Wake, 1966). Batrachoseps also has higher numbers of trunk vertebrae (16-23) than all genera in the supergenus Bolitoglossa other than Oedipina, shows high levels of variation in number of trunk vertebrae within and between populations (Anderson, 1960; Jockusch, 1997; Yanev, 1978), and is the only plethodontid known to have variation in the number of caudosacral vertebrae (2-3; Wake, 1966). Batrachoseps is also characterized by a slender, rather than enlarged, tail base, and is able to autotomize and regenerate the tail anywhere along its length. Vertebrae are added to the tail throughout life, and tail length may greatly exceed trunk length in old individuals. Males have fewer, larger premaxillary teeth than females, and also have, on average, fewer trunk vertebrae (Anderson, 1960; Jockusch, 1997). Multivariate analysis of morphometric data shows that males of B. attenuatus are more robust than females, with slightly shorter trunks at a given size. This has not been investigated in other species. The diploid chromosome number is 26, a trait shared with the subgenus Batrachoseps, and diploid genome sizes range from 26.0-42.0 pg/haploid nucleus (Gregory, 2006; R. Mueller, pers. comm.). Batrachoseps are thought to be highly sedentary. Two mark-recapture studies have found maximum distances moved of less than 5 m (Anderson, 1960; Hendrickson, 1954). All members of the genus are direct developing. Oviposition is communal in at least three species (B. attenuatus, B. gregarius and B. major), and females do not attend the eggs (Jockusch and Mahoney, 1997). Females likely oviposit individually in B. wrightorum. Four species, B. campi, B. robustus, B. wrightorum, and northern populations of B. gregarius, oviposit in the spring, as is typical for other plethodontids in California. By contrast, most species of Batrachoseps, and southern populations of B. gregarius, oviposit in the fall or early winter, at the onset of the rainy season. There are three sets of Miocene fossils that have been assigned to Batrachoseps, although none are assignable to species. Peabody (1959) reported fossil trackways from Tuolumne Co., California. Clark (1985) identified isolated vertebrae from Turlock Lake, in the Central Valley of California, and from Pinole Tuff in the East San Francisco Bay Region. Interestingly, all of these individuals appear to have been relatively large—comparable to the largest specimens of Batrachoseps known. The coastal specimens are much larger than the B. attenuatus presently found in the area. Batrachoseps has been traditionally classified as a member of the subfamily (formerly tribe) Bolitoglossinae. With the removal of Hydromantes from this group, Batrachoseps is the only representative of the Bolitoglossinae that occurs outside of the Neotropics, and it is likely the sister taxon to all remaining members of the subfamily (supergenus Bolitoglossa). Two subgenera of Batrachoseps are recognized: the subgenus Plethopsis, containing three species (B. campi, B. robustus, and B. wrightorum) and the subgenus Batrachoseps, containing 16 species, one with two recognized subspecies. These are divided into four major species groups: the attenuatus group, including the single species B. attenuatus; the pacificus group, including B. gabrieli, B. luciae, B. gavilanensis, B. incognitus, B. minor, B. major (with two subspecies, B. m. major and B. m. aridus) and B. pacificus; the nigriventris group, including four described species, B. simatus, B. stebbinsi, B. nigriventris, and B. gregarius; and the relictus group, also including four species, B. diabolicus, B. regius, B. kawia, and B. relictus. Batrachoseps has been included in molecular studies of plethodontid relationships by Jackman et al. (1997), Chippindale et al. (2004), Frost et al. (2006), and Mueller et al. (2004). Macey (2005) discusses the results of parsimony analysis of the dataset of Mueller et al. (2004). The analysis of Frost et al. (2006) includes 2.3 kb of data from Mueller et al. for two species of Batrachoseps, but is based on a smaller sampling of taxa and characters than both Chippindale et al. (2004) and Mueller et al. (2004), so is not considered here. Mueller et al.’s (2004) dataset includes whole mitochondrial genome sequences for two species of Batrachoseps (one of each subgenus), four other bolitoglossines, and 16 non-bolitoglossine plethodontids. Using likelihood and Bayesian analyses of whole mitochondrial genomes, Mueller et al. recover Hemidactylium scutatum as the sister group to Batrachoseps with high support, making Bolitoglossinae paraphyletic. By contrast, in parsimony analyses, a monophyletic Bolitoglossinae is recovered, and H. scutatum is instead placed as the sister to all other plethodontids. Chippindale et al. (2004) analyzed 123 morphological characters and DNA sequence data from two mitochondrial genes (cytochrome b and nadh 4) and one nuclear gene (recombination activation factor 1) from 31 plethodontids, including B. major and representatives of three Neotropical genera. Parsimony analysis of the morphological data matrix, as well as parsimony and model-based analyses of the molecular data, recovers a monophyletic Bolitoglossinae with strong support. None of the analyses resolve the placement of H. scutatum, but they reject the hypothesis that it is sister to Batrachoseps. The strong conflict between the sister group of Batrachoseps identified by Mueller et al. (2004) and by Chippindale et al. (2004) points to the need for additional work to resolve this discordance. If Batrachoseps and Hemidactylium are sister taxa, then two traits interpreted as synapomorphies for Batrachoseps above should be reinterpreted as synapomorphies for the larger clade formed by these two lineages: the presence of only four foes on the hind feet, and a projectile tongue attached anteriorly by an elongated genioglossus muscle (Mueller et al. 2004). While Batrachoseps and Hemidactylium share an elongated genioglossus muscle, they differ in other aspects of tongue morphology, including the degree of attachment between the cornua and first basibranchials (separated by connective tissue in Hemidactylium vs. fused together in Batrachoseps), and shape of the first basibranchial (broadest posterior to the attachment of the cornua in Hemidactylium vs. broadest anteriorly in Batrachoseps; Wake, 1966; see also Lombard and Wake, 1986). Furthermore, the genioglossus muscle is only slightly elongated in Hemidactylium (as in Ensatina), whereas it is extremely long and migrated posteriorly along the mandible in Batrachoseps. Communal oviposition sites have also been found in Hemidactylium. While Jockusch and Mahoney (1997) interpreted communal oviposition as a possible synapomorphy for the subgenus Batrachoseps, a close relationship between Hemidactylium and Batrachoseps would suggest an alternative, equally parsimonious interpretation of this character as ancestral for the larger clade, and possibly lost in the subgenus Plethopsis. Within Batrachoseps, the basal split is between subgenus Plethopsis and subgenus Batrachoseps. The three species in the subgenus Plethopsis are united morphologically by a set of ancestral characteristics, including paired premaxillae and a relatively robust habitus. Molecular data strongly support the monophyly of the group, but fail to resolve relationships among the three species. Cytochrome b sequence data recover a weakly supported sister group relationship between B. robustus and B. wrightorum when analyzed using parsimony, and a more strongly supported sister group relationship between B. robustus and B. campi when analyzed with other methods (Jockusch and Wake 2002). Jackman et al. (1997) also included all three species in the subgenus Plethopsis. Their morphological data do not support any resolution within the subgenus, and parsimony analysis of a shorter fragment of cytochrome b recovers B. wrightorum and B. campi as sister groups with weak bootstrap support. Several morphological synapomorphies distinguish the subgenus Batrachoseps from its sister group, including adult fusion of the premaxillae, loss of prefrontal bones, and reduction or loss of the preorbital processes of the vomer (Jackman et al. 1997; Wake 1989). Although no morphological characters supporting individual species groups have been identified, the four species groups are concordantly identified by allozyme and mitochondrial DNA sequence data (Yanev, 1980; Jockusch and Wake, 2002). B. attenuatus is sister to the rest of the subgenus. Among the other three groups, a sister group relationships between the relictus and nigriventris groups is strongly supported by analysis of partial mtDNA genomes (R. Mueller, pers. comm.). By contrast, allozyme data suggest that the relictus and pacificus groups are more closely related. Additional sources of information on relationships within species groups and variation in individual species include Jockusch et al. (1998, 2001), Miller et al. (2005), Wake and Jockusch (2000), Wake et al. (2002) and Yanev and Wake (1981). B. m. aridus is classified as endangered under the U.S. Endangered Species Act and by the State of California, and as critically endangered by the IUCN. B. m. aridus is known from only two canyons in the Santa Rosa Mountains of Riverside Co. in southern California, one of which has been set aside as a fully protected reserve for the species. One species (B. campi) is listed as endangered and four (B. regius, B. stebbinsi, B. simatus, and B. wrightorum) are listed as vulnerable to extinction by the IUCN. Both B. stebbinsi and B. simatus are also classified as threatened by the State of California, while B. relictus and B. campi are classified as species of special concern. B. wrightorum is threatened primarily by habitat loss, while the other species are listed primarily because of their restricted distributions. B. regius was originally known from only the Kings River drainage of the central Sierra Nevada, but mitochondrial DNA data suggest that its range extends to the Middle Fork of the Kaweah River, with one isolated population south of the river. B. simatus is endemic to the Kern River Canyon below Lake Isabella, and individuals have only been found at a few localities in the last three decades. B. relictus has also declined severely in the Kern River Canyon, where it has not been found since the early 1970s. It can still be found north of the Kern River, and its range extends to the Tule River drainage. B. stebbinsi occurs in the Transverse Ranges (Tehachapi Mountains) of southern California. Studies of mtDNA and allozyme variation identify two genetically distinct lineages, a northern lineage in the Walker Basin, south of Kern Canyon, and a more southwestern lineage extending from Fort Tejon State Park across the Tejon Ranch. Only a handful of individuals have been recorded in the last several decades. B. campi is restricted to the Inyo Mountains of California, where it has a relatively broad elevational range but is highly dependent on moist microhabitats in this arid environment; it appears to be less abundant than when it was first discovered. B. minor is another species with a highly restricted range that may have undergone a substantial population decline in the last several decades. This species occurs sympatrically with B. nigriventris in the central Coast Ranges. The two species used to have relatively similar abundances, but now, sighting of B. minor are rare, while B. nigriventris remains common in the region. Anderson PK. 1960. Ecology and evolution in island populations of salamanders in the San Francisco Bay region. Ecological Monographs 30:359–385. Chippindale PT, Bonett RM, Baldwin AS, Wiens JJ. 2004. Phylogenetic evidence for a major reversal in life history evolution in plethodontid salamanders. Evolution 58:2809-2822. Clark JM. 1985. Fossil plethodontid salamanders from the latest Miocene of California. Journal of Herpetology 19:41–47. Frost DR, Grant T, Faivovich J, Bain RH, Haas A, Haddad CFB, De Sá RO, Channing A, Wilkinson M, Donnellan SC. 2006. The amphibian tree of life. Bulletin of the American Museum of Natural History 297:1-370. Gregory TR. 2006. Animal Genome Size Database. http://www.genomesize.com. Hendrickson JR. 1954. Ecology and systematics of salamanders of the genus Batrachoseps. University of California Publications in Zoology 54:1-46. Jackman TR, Applebaum G, Wake DB. 1997. Phylogenetic relationships of bolitoglossine salamanders: a demonstration of the effects of combining morphological and molecular data sets. Molecular Biology and Evolution 14:883–891. Jockusch EL, Mahoney MJ. 1997. Communal oviposition and lack of parental care in Batrachoseps nigriventris with a discussion of the evolution of breeding behavior in plethodontid salamanders. Copeia 1997:697-705. Jockusch EL, Yanev KP, Wake DB. 2001. Molecular phylogenetic analysis of slender salamanders, genus Batrachoseps (Amphibia: Plethodontidae), from central coastal California with descriptions of four new species. Herpetological Monographs 15:54-99. Jockusch EL. 1997. Geographic variation and phenotypic plasticity of number of trunk vertebrae in slender salamanders, Batrachoseps (Caudata: Plethodontidae). Evolution 51:1964-1980. Jockusch EL, Wake DB. 2002. Falling apart and merging: the diversification of slender salamanders (Plethodontidae: Batrachoseps) in the American West. Biological Journal of the Linnean Society 76:361-391. Lombard RE, Wake DB. 1986. Tongue evolution in the lungless salamanders, family Plethodontidae. IV. Phylogeny of plethodontid salamanders and the evolution of feeding dynamics. Systematic Zoology 35:532-551. Macey JR. 2005. Plethodontid salamander mitochondrial genomics: a parsimony evaluation of character conflict and implications for historical biogeography. Cladistics 21:194-202. Miller MP, Haig SM, Wagner RS. 2005. Conflicting patterns of genetic structure produced by nuclear and mitochondrial markers in the Oregon slender salamander (Batrachoseps wrighti): implications for conservation efforts and species management. Conservation Genetics 6: 275-287. Mueller RL, Macey JR, Jaekel M, Wake DB, Boore JL. 2004 Morphological homoplasy, life history evolution, and historical biogeography of plethodontid salamanders inferred from complete mitochondrial genomes. Proceedings of the National Academy of Sciences USA 101:13820–13825. Peabody FE. 1959. Trackways of living and fossil salamanders. University of California Publications in Zoology 63:1-72. Wake DB, Jockusch EL. 2000. Detecting species borders using diverse data sets: plethodontid salamanders in California. Pp. 95-119 in Bruce RC, Jaeger RG, Houck LD, eds. The Biology of Plethodontid Salamanders. New York: Kluwer Academic/Plenum Publishers. Wake DB. 1966. Comparative osteology and evolution of the lungless salamanders, family Plethodontidae. Memoirs of the southern California Academy of Science 4:1-111. Wake DB. 1989. Phylogenetic implications of ontogenetic data. In David B, Dommergues J-L, Chaline J, Laurin B, eds. Ontogenèse et Évolution. Geobios, Mémoire Spécial 12:369-378. Wake DB, Yanev KP, Hansen RW. 2002. A new species of slender salamander, genus Batrachoseps, from the southern Sierra Nevada of California. Copeia 2002:1016-1028. Yanev KP. 1978. Evolutionary studies of the plethodontid salamander genus Batrachoseps. Ph.D. dissertation, University of California, Berkeley. Yanev KP. 1980. Biogeography and distribution of three parapatric salamander species in coastal and borderland California. Pp. 531-550 in Power DM, ed. The California Islands: Proceedings of a Multidisciplinary Symposium. Santa Barbara: Santa Barbara Museum of Natural History. Yanev KP, Wake DB. 1981. Genetic variation in a relict desert salamander, Batrachoseps campi. Herpetologica 37:16-28. Elizabeth Jockusch contributed to the preparation of this Tree of Life page.